On the Event Types page, you can define the kinds of events your troop can host, and determine what TroopWebHost features will be enabled for each event. It is accessed through Site Configuration → Event Types. Each event type has a number of settings that enable or disable the display of certain types of information. When creating a new event type, you may want to disable attributes that aren't relevant to the event; for instance, Display Cycling Miles? would not be appropriate for a "Scout Sunday" event. The first section identifies this event type. Event Type Name: This will be the name for all events of this type, unless you enter a specific name for each event. Display Sequence: Sets the relative order of this item in the list of event types. A lower number will cause this Event Type to appear higher on the list. Display on Calendar? : Determines whether this type of event is displayed on the troop calendar. Display on Home Page? : Determines whether this type of event is displayed by any of the widgets that can list upcoming events on your home page or other custom pages. Include in iCalendar Subscription? : Determines whether this type of event will be included when you Subscribe to the Troop Calendar. Display In Newsletter? : Determines whether the event is automatically added to the troop newsletter. Require a Location? : Determines whether a user is required to enter a location for this type of event. Display Dress Code? : Allows you to select the required dress code for events of this type. Display Estimated Cost? 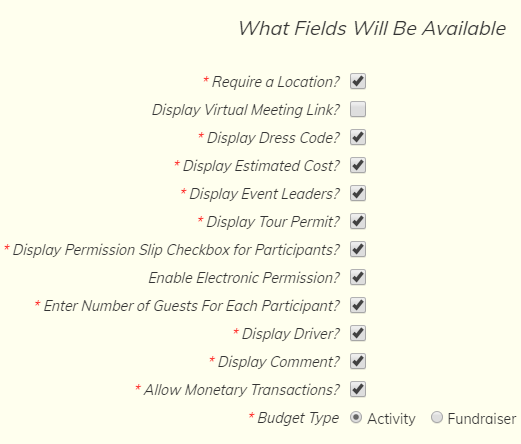 : Allows you to set and display the amount of money the event is expected to cost each participant. Display Event Leaders? : Allows you to enter two leaders for this event. Leaders can be scouts or adults. Display Agenda? : Allows you to upload an agenda for the event. This is done on the Maintain Events page. The agenda will then be available from the Activities → Meeting Agendas & Minutes page. Display Minutes? : Allows you to upload the event minutes. This is done on the Maintain Events page. The minutes will then be available from the Activities → Meeting Agendas & Minutes page. Display Other Document? : Allows you to link to a webpage or upload another document. This is done on the Maintain Events page. The link or document will then be available from the Activities → Meeting Agendas & Minutes page. Display Other Document 2? : Allows you to create a link to another webpage or upload another document. Display Tour Permit? : Enables a Tour Permit Submitted checkbox on the Maintain Events page. Tour permit worksheets can be downloaded from the same page. Display Permission Slip Checkbox for Participants: Creates a checkbox for permission slip submission on the Sign Up Members page. Enable Electronic Permission: Gives parents the ability to electronically sign a permission slip for a scout to attend the event. Enter Number of Guests For Each Participant: Allows users to enter the number of guests they plan to bring to this event. Display Driver? : Displays Driver? checkboxes on the Sign Up For Upcoming Events page and on the Sign-up List tab of the Maintain Events pages. When a user checks this box, it indicates that they can provide transportation to the event for others. It will then prompt the user as to whether they can drive to the event, from the event, or both ways, and the number of seats in the vehicle they will be using. Display Comment? : Allows users to enter comments next to events in the Sign Up For Upcoming Events page. Comments are also displayed in the Sign-up List tab on the Maintain Events page. Allow Monetary Transactions? : Allows users to debit and credit events through monetary transactions. Events with this flag enabled can have their balances reduced through debiting or increased through crediting. See Event Balances for more information. Budget Type: If the event type allows monetary transactions, you may then select whether events of this type show up as activities in the expense section of the budget, or as fundraisers in the fundraiser section of the budget. Allow attendance to be limited to a subgroup: Allows you to create events that only allow members of a selected dynamic subgroup to attend. Enable Shifts: Allows you to set up Shifts for this event, which your members can then sign up for. Display on Sign-Up List? : Allows users to sign up online via the Sign Up For Upcoming Events page or from the troop calendar.. Display Sign-Up Deadline? : Allows you to set a sign-up deadline, after which users cannot sign up for the event. This will also give you a sign-up start date, which determines when members can first sign up for an event. Enable Sign-Up Limits: Allows you to set limits on the number of scouts and adults who can sign up for this type of event on-line. Display Camping Nights? : Will cause the system to compute the number of camping nights for this event, which you may override for individual scouts when you take attendance. Scouts who attend events with camping nights will have those nights added to their total, which is displayed on the Individual Advancement page. Display Cabin Camping Nights? : Will cause the system to compute the number of camping nights for this event, which you may override for individual scouts when you take attendance. Cabin camping nights are not counted towared the requirements for Camping merit badge or Order of the Arrow eligibility. Scouts who attend events with cabin camping nights will have those nights added to their total, which is displayed on the Individual Advancement page. Display Service Hours? : Allows you to enter the number of community service hours served during this event. Scouts who attend events with community service hours will have those hours added to their total, which is displayed on the Individual Advancement page. Please note that fundraisers do not count as community service. Display Conservation Service Hours? : Allows you to enter the number of conservation service hours served during this event. Scouts who attend events with conservation service hours will have those hours added to their total, which is displayed on the Individual Advancement page. Display Hiking Miles? : Allows you to enter the number of miles that will be hiked during this event. Scouts who attend events with hiking miles will have those miles added to their total, which is displayed on the Individual Advancement page. Display Backpacking Miles? : Allows you to enter the number of backpacking miles for this event. This will add to the participating scouts' backpacking miles total which will be displayed on the Individual Advancement page. Display Cycling Miles? : Allows you to enter the number of miles that will be biked during this event. Scouts who attend events with cycling miles will have those miles added to their total, which is displayed on the Individual Advancement page. Display Paddling Miles? : Allows you to enter the number of miles that will be canoed or kayaked during this event. Scouts who attend events with paddling miles will have those miles added to their total, which is displayed on the Individual Advancement page. Display Motorboating Miles? : Allows you to enter the number of miles covered via motorboat in this event. This will add to the participating scouts' motorboating miles total which will be displayed on the Individual Advancement page. Display On The Water Hours? : Allows you to enter the number of hours spent on the water at this event. This will add to the participating scouts' on the water hours as defined for the National Outdoor Awards Aquatic segment, which will be displayed on the Individual Advancement page. Display Horseback Riding Miles? : Allows you to enter the number of horseback riding miles at this event. This will add to the participating scouts' horseback riding miles total which will be displayed on the Individual Advancement page. Display Skating Miles? : Allows you to enter the number of skating miles at this event. This will add to the participating scouts' skating miles total which will be displayed on the Individual Advancement page. Send Reminder Prior To Event? : Will enable event reminders for events of this type. Selecting this option will reveal the next four options to configure these reminders. Type of reminder: Determines whether event reminders will be sent to e-mail addresses, SMS text message addresses, or both. Send reminder to: Determines whether event reminders will go to everyone, participants only, undecideds only, or participants and undecideds. Send copy of reminder to parents? : Determines whether the parents of the intended recipients will receive a copy of the reminder. How soon before event to send reminder? : Configures reminders to go out the same day as the event, or one to six days prior, or one to four weeks prior to the event. Event Type Disabled? : Hides this event type on all event type choice lists. This does not change any existing events, but prevents users from creating new events of this type.